The Clarke CFP Pro 17HD is a rugged, high-powered machine that is built to last. With easy-to-use fingertip controls and multiple safety features, it is the perfect floor buffer for a variety of different floor cleaning applications. A pad holder is included for scrubbing, stripping, and buffing with the proper pads. Its all-metal construction can withstand years of constant use, allowing it to conquer any task. More torque, better cooling and easy maneuverability make even the toughest jobs a snap. A switch lock mechanism helps prevent accidental start ups and the negative pressure trigger bar shuts the machine off when the operator lets go. The powerful motor and planetary gear system on this floor machine provide smooth, quiet and reliable operation. Epoxy powder coated steel brush cover resists chemical and corrosion attacks, providing exceptional durability. Foot-controlled handle lock makes adjustments easy and minimizes operator bending and fatigue. If this machine isn't quite what you're looking for and you need something a little more economical, please take a look at our complete line of low speed floor buffers. 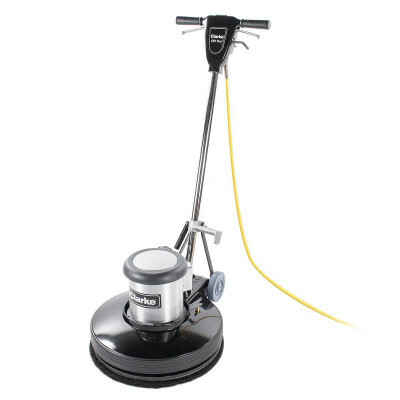 We also have the Clarke® dual speed floor buffing machine available in our dual speed buffers section. Soft, non-slip handle grips provide operator comfort and control. Easy-to-use fingertip controls and multiple safety features prevent accidental start ups. Hook stores cord conveniently and easily for quick access. 50', UL-listed, non-marking power cord provides maximum reach between outlets. Chrome plated steel handle provides maximum machine control, strength and durability. High strength aluminum frame is corrosion resistant & ensures stable operation. Wrap-around, non-marking bumper protects machine, furniture, walls and fixtures. Customers who were interested in the Clarke® CFP Pro® 17" Floor Buffer were also interested in the following items. This product has almost paid for itself already. We had been renting a unit previously. This does exactly what I need , isn’t ridiculously expensive and is built to last. Shipping from Rocket Industrial was much faster than I expected.... less than 3 days from order date. best machine I've bought in a while. I have half dozen buffers that I keep at differednt places. This one is great for the price. Very nice machine, runs very smooth, soft start up and good power. We change pads often and need to raise and lower the handle often to do so. I wish the machine had a release up at the controls as opposed to having to bend over and release to adjust handle. This is a review for the Clarke® CFP Pro® 17" Floor Buffer.